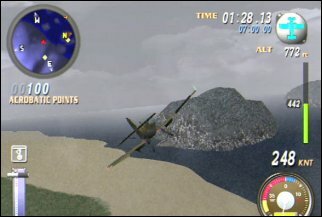 Sony's first flight "sim" turns heads with the great gameplay that is Sky Odyssey for the PS2. Being one of the original launch line up titles (or just thereafter), Sky Odyssey doesn't stand out now amongst the current crop of beautifully rendered games. This however does not affect a single thing. The title plays like a dream and the physics and gravity of the system are excellent to play. The sensation of being in the air prevails and you are subject to most common things like wind direction, weather, etc. etc. Not to mention smacking into the side of a hill or the ground is very very bad indeed! The premise of the title is simplicity itself: Fly the plane of your choice toward targets in the sky (waypoints). These are denoted by rings in the air that you can pass through. Upon going through a ring, another will appear for you to head toward. There is a time limit and learning how to effectively control your craft is paramount to success as you progress through the game. 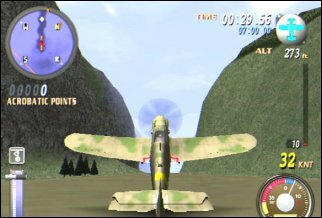 Sky Odyssey will frustrate some players who have not had much experience with a dual shock controller as it utilises most buttons. However considering how long the title has been around now at the time of reviewing, most people will be savvy enough with a controller to be flying immediately. 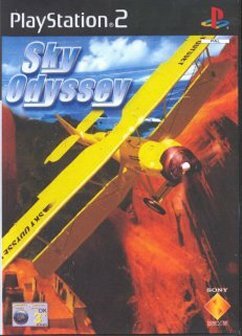 I haven't seen Sky Odyssey on the shelves for some time and competing against the current crop would see this title performing badly unless it is included in the new PS2 Platinum range. If you see this game for $60 or less, it's definitely worth picking up for some great flight action!